The Ohio Grocers Association, the Ohio Grocers Foundation, and the Ohio State University Extension support a focus on food safety. To this end, we have developed the Pathway to Food Safety training program. 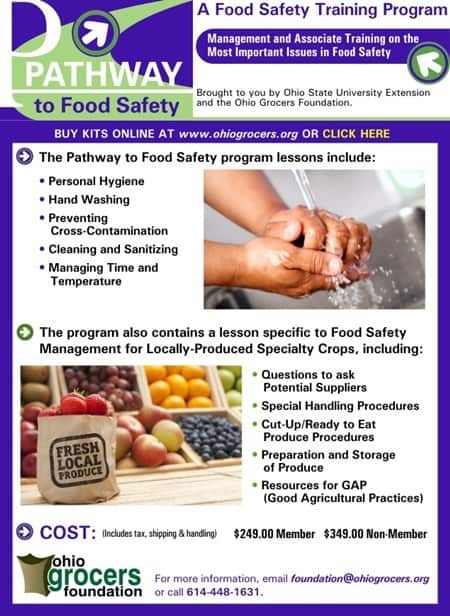 The Pathway to Food Safety Program was financed in part through a grant from the Ohio Departement of Agriculture, the State of Ohio, and the United States Department of Agriculture under the provisions of the Specialty Crop Block Grant. Special thanks to Ohio State University Extension and Ohio State University College of Food, Agricultural, and Environmental – Communications and Technology on the production of this program. Questions? Contact Christopher Schweitzer at 614.442.5511 ext. 7130 or design@ohiogrocers.org.